Hi. I’m Mrs. Gore, and I am an introvert. If I didn’t already know that from a fun little personality quiz my FFA instructor administered to our class when I was in high school, I would certainly know it today from the daily article or quiz I see on Facebook about introverts and what defines an introvert and how introverts deal with the world and 10 things you don’t know about introverts and introvert introvert introvert. These articles and quizzes always pique my interest because, like everyone else, I like to know more stuff about myself and what makes me tick and what makes me “me”. It’s the American way, isn’t it, to analyze and re-analyze ourselves? We sort of thrive on psychology, especially when it comes to our own personalities. But the thing I have noticed about so many of these extroverted introvert articles (get it? Because they’re everywhere?) is that, once the information is presented about all-things-introvert, the article ends, leaving you with basically just another explanation from another person of “this is who I am” and “accept me for who I am” and “this is what you can expect from me” and “this is why I poop out at parties”. End of story, right? I’ve done my part by explaining who I am and what I like and now it’s up to everyone else to be okay with that. And what can happen to introverts like me who read a hundred articles about why I am the way I am and why I feel the way I feel in social settings is an acceptance that could, if left unchecked, lead to a laziness and entitlement that could greatly damage the health of my church and stilt my Kingdom potential. Self-acceptance is a good thing when it allows us to rest contentedly in the way God crafted our personalities and talents, but it also is a state of mind that can easily turn toxic, is it not? John Bloom at Desiring God (and one of my favorite writers in the land!) describes this tricky line much better than I ever could. Read his article here. and, if I’m not very, very careful, I can take this psychological research and this introverted testimonial and I can withdraw to my comfy place, and instead of feeling any pause over this course of action like I normally would, I now feel justified and empowered. This sort of attitude could surely be dangerous in any person’s life, but believe me when I say that it can be downright debilitating for a believer. Now, because this is the internet and every argument is met with counterarguments, let me be quick to assure you that I AM NOT saying it is a bad thing to know who you are and to think about how God made you and to know your limitations and to draw some boundaries about what you are capable of. I am sure that many an introvert like myself has unwisely overextended themselves and crashed into a miserable pile of burn-out because they didn’t take time to nurture their heart. And who knows? Maybe the typical components of being an introvert are not as precious as we’ve made them out to be. One of the favorite things I have drawn from my husband’s expository preaching through 1 and 2 Corinthians is the message that we have each been gifted by God to accomplish certain tasks in our local body. He has equipped us, introverts, extroverts, ambiverts, and herbivores, to do exactly what He wants done in the communities He has placed us in, and we can take joy and be confident in that. But here’s the part that really blew me away: we can ALSO, while working with our gifts for the betterment of the church, look to the gifts of others in our body and pursue those gifts, as well. And that’s yet another reason why it is so important for us to physically meet together and spur each other on to love and good works because – for instance! – while I am not naturally wired to serve, I can see those gifts in my sisters and brothers, and when I do, I am motivated to follow them and do as they do. They TEACH me how to serve, so that, in the end, what you get is a girl who, though not normally inclined to be a servant, is serving. And that same principle can be applied to any number of good things that God desires for His children to display. And you know what? At the end of the day, this biblical call to growth and transformation is so much more exciting to me than the latest human research about who I am and how I am always going to be. I want to look like Christ, period. I want to chase after every fruit that the Bible says I should have as one who has been cleansed by the healing blood of Jesus, and if that pursuit sometimes challenges my introverted heart to die to its natural tendencies and forces me to be in large crowds or to talk on the telephone or to have people constantly in my home or to engage in “small talk” with a loving heart or to pray out loud in front of people I don’t know, then so be it. And piece by piece, someday, my prayer is that I will be known less as a typical introvert and more like another redeemed person who has lost their natural identity in Christ. That maybe, just MAYBE, I will take an online personality quiz and break the internet because “Jesus” isn’t one of the quiz results. By God’s grace, I am beginning to understand that, if I will simply be faithful to the Word first and foremost — even if it feels draining or scary — by meeting with my brothers and sisters, by being hospitable, and by showing love always, that I can trust my timorous, introverted heart to God and know that He will take care of me and that His Spirit will lead me every step of the way. God is not cruel or uncaring, and if I truly need quiet time to recharge, He will ensure that I get it, sometimes, even by inspiring me to ASK for it. And, friends, believe me when I express to you how this call to holiness has helped me so much more than another article on introverts. The articles patted me on the head and told me I was doing okay. The Word and the Spirit help me to grow and to CONQUER the things that, if left to my own devices, might become poisonous and idolatrous. in other words, to not put my perceived needs first, but to live for others, and watch, amazed, when there is still miraculously just enough time for me and my introverted tendencies to heal and rest. The Christian life is so much more adventurous than any of the psychological boxes our culture loves to put us in. but shame on me if I ever allow a man-made title to weaken my potential for God. I PRAY this was a help to any of my fellow God-fearing introverts. 🙂 And if you’re new here and would like to keep up with Mrs. Gore and family, you can find us on Facebook. Yes, fellow introvert, it helped me. I struggle with this as well. But truly, I LOVE being with my church family. It revitalizes this reluctant socializer, sometimes even more than being alone. It’s a balancing act, to be sure, but being in community is so important to living the full, abundant life that Jesus came to bring (John 10:10). Thanks for this insightful post. Thank you SOOOOOOO much for this post. I am also an introvert and it is very easy to sit back and just let the world go by because I am an introvert. But I would be missing out on so many blessings if I just hide out in my room ( which I would love to do many days). And as an extrovert, I need to move out of the way and let you introverts teach me how to think before acting, how to cherish time alone, and how to let someone else have some attention too. Thank you, Mrs. Gore! This article is so inspiring and is exactly what I need to be working on! My natural tendency is to hide in my house, fearing pretty much any form of human contact other than my family (and honestly, sometimes I’d like to hide from them too 😕 lol). But my God did not give me a spirit of fear! Love, love, love this! Thank you for putting into words something so true and beautiful about our creation and calling. So encouraging to me today, and challenging in the best of ways! Thank you for this great post! It’s so true, but sometimes I forget it. And now, I have found your blog and read that what I need to open my eyes! Amen, amen, and amen!! Thank you for confirming so eloquently what God has been teaching me and for spurring us introverts on to become more like Christ! Maybe we have different ideas of what “being an introvert” means, but we are all members of the Body of Christ. The parts that don’t make a show of themselves – say, the intestines – are the ones that provide the most nourishment to the body. Folks who are content – nay, delighted! – to sit and fold bulletins, sort VBS materials, file, flip pancakes in the kitchen, are EVERY BIT as important as the ones who hand out those carefully folded bulletins, teach VBS, and so forth. God has given each of us different callings, different gifts, and they all work together for His glory. I’d like to be an opera singer, but that’s not what God called me to be. 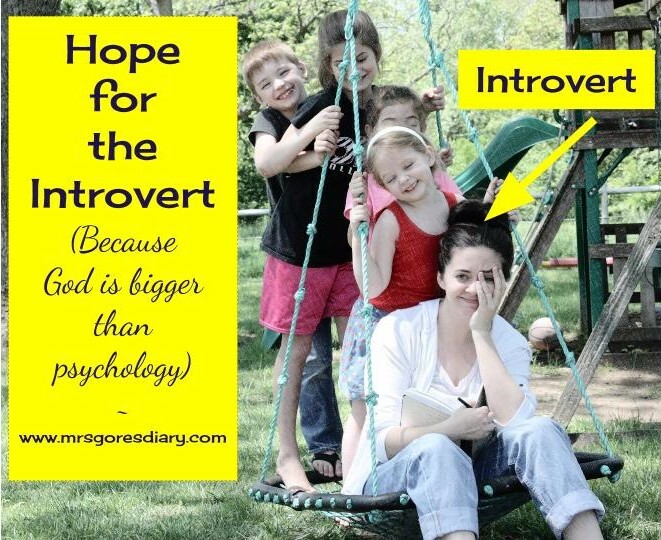 I’m an introvert, and it took me a long time to accept that fact that this is also a very important part in God’s plan for me, and His church. Now, I need to get these sermons filed, if you’ll excuse me. Amen, absolutely! For a long time I used my status as an extreme introvert to justify the fear of man and to excuse myself from any frightening ministry opportunity that came along. But when God set me free from the fears I learned something awesome, that He uses me most where I am weakest and I have watched Him do amazing things with my life to encourage people that I used to be too shy to interact with. God loves using us where we are weakest so that He can show just how mighty He is and how much He loves us. This is so true and beautiful, because of the hope it offers…we are not stuck in our label, beyond God’s sight or control. Thank you for having the courage and heart to speak this truth to us.